While at Marineland this summer, we were thrilled when our son got to feed the Beluga Whales for just a few minutes. They are such gentle, amazing creatures, which is probably why the staff at Qingdao Polar Ocean World in China’s eastern Shandong Province is letting a four year old boy swim with one in between sailing events at the 2008 Olympic Games. 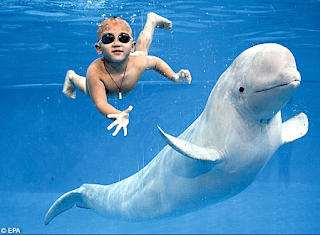 Yang Yang, the lucky little boy, has been swimming since he was one. The pair first appeared in public together during the country’s National Children’s Day in the summer. It proved such a success that it was decided to make them an Olympic attraction. There are fewer than 80,000 beluga whales left in Arctic waters, with St Lawrence, Cook Inlet, and Alaskan belugas classified as endangered. The recently completed Qingdao Polar Ocean World is home to more than 10,000 ornamental fish, as well as white whales and polar bears – and is one of the largest polar marine animal parks in the world.